Fort Bragg, California or Shoreline, Washington. Folks new to my blog wonder why I call it Walking Fort Bragg when I'm Walking Shoreline? Well, I'm currently on assignment! I am the primary caregiver for my 93 year old mother-in-law. At the end of May my wife will arrive, take over and I will return to Fort Bragg. California. Yes, we are ships passing in the night but hey! We're doing a good thing! To give you an idea of where Shoreline is in relation to Seattle, here's a map. 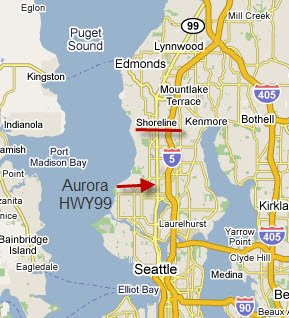 I've also indicated Highway 99, what is now called Aurora Avenue I took photos of yesterday. At 4:55 this morning the first Robin burst into song! 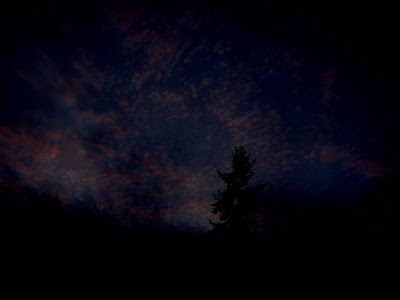 The sun started arriving on the Olympics at 6:30. Honest officer, I was only doing 3 miles per hour! One of those soft misty mornings. Aurora Avenue. I knew it as Highway 99. The nursery at Home Depot caught my eye. And then the backside of some of the shops along Aurora. time to head back to Margaret. Not bad for hand held in early morning light. Yesterday afternoon the neighbor brought over his pet. It became quite agile after it warmed up in the afternoon sun. Quite amazing. This guy is two years old. That is an ear opening in the lower left of this photo. It's just an opossum. Right? Returning from my walk I notice two things; the Olympic Mountains are missing and it is garbage collection day. What a difference a day makes, twenty four little hours! Seventy four sunny degrees yesterday. Fifty four drizzly degrees today. Perfect for visiting a "big box" store. I needed some work gloves and a night light bulb. Of course Home Depot had 'em. This Home Depot is a two mile round trip walk from grannie's house. One of my readers sent in a comment telling me the flower I was wondering about yesterday is a Star Magnolia. I Wikipedia-ed it and it is quite a plant! Granny and I revisited it yesterday afternoon so I could take some better photos. The information said they grow to around 20 feet tall. I'd say this one is well on its way! Song titles come to mind recently! ShortLegs caught yesterday's effort! Anyway, here's the Olympics at 6:10 this morning. The days are getting longer! I visited PCC this morning to replenish my oatmeal supply from their bulk section. I really like this store and I'm pleased to see they are still in business. I noticed this amazing tree. I have no idea what it is but it sure is something! I see I'm a bit out of focus and may have to revisit with a tripod. If you look close you can see last season's christmas lights are still in place!